It hit the net this week that National Lampoon's Vacation is getting the reboot treatment. The reboot is being written and directed by John Francis Daley and Jonathan Goldstein, the writers behind this summer's Horrible Bosses. Incidentally, Daley plays Doctor Lance Sweets on the TV show Bones. The latest rumor is that Ed Helms is in the running to play the lead, and that the story will follow Rusty Griswold, Clark's son, originally played by Anthony Michael Hall, as he takes his family on a summer vacation. I kind of love this film and am sad, but not shocked, that it's getting the remake/reboot treatment. Both of my parents were teachers, so they had time off in the summer, and they dragged us in their old wood sided station wagon on insanely long camping trips to scenic hellholes every summer. Much fishing was done. Little bathing was done. 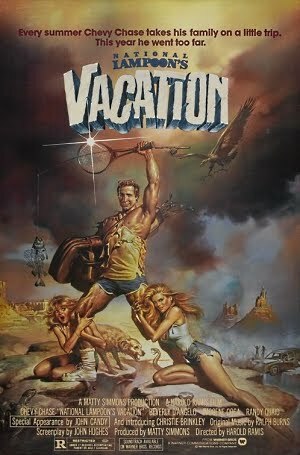 So I have always gotten a kick out of Vacation because it was a (slightly) more insane version of my family. Also, Chevy Chase and Beverly D'Angelo are awesome in it, and the original making fun of the Star Wars poster rules. I like me some Ed Helms but really? We have to do this? The Christmas movie is a close second for me. Cats getting electrocuted makes my family laugh, every single time. Who else loves the Griswolds? Do we need to see the second generation?